Common Standing Liberty Silver Quarters (Any Date 1916 - 1930) Buyer. 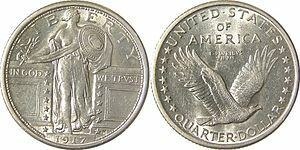 Price shown is PER COIN for clean, undamaged, circulated or uncirculated silver quarters, any date. BUY THE POUND: There are roughly 78 coins per pound depending on surface wear.